Kyle Lowry is an American basketball player who began his professional journey in 2006 after he was selected with the 24th overall pick by the Memphis Grizzlies during the 2006 NBA draft. The point guard has built an outstanding legacy over the years and currently plays for the Toronto Raptors of the National Basketball Association (NBA). Since he joined the team in 2012, he has helped them to 56 wins, setting a record of the franchise highest victory in history. In 2016, Kyle won a gold medal having featured as a member of the U.S. men’s national team at the 2016 Summer Olympics. Kyle Lowry was born on March 25, 1986, in Philadelphia, Pennsylvania where he attended Cardinal Dougherty High School, playing point guard for the school’s basketball team. By the time he was done with high school in 2004, Rivals.com rated Lowry a five-star recruit and he was listed as the No. 6 point guard and the No. 28 player in the U.S. that year. Moving on to Villanova University where he played for Villanova University’s men’s basketball team, Kyle Lowry played impressively and was named to the Big East All-Rookie team while also earning the Philadelphia Big Five Rookie of the Year. By the time his junior year was over, he had played in 24 games (3 starts) with an average of 7.5 points, 3.2 rebounds, 2.0 assists and 1.3 steals per game. In his second year, he played in 33 games, made 31 starts, averaged 11.0 points, 4.3 rebounds, 3.7 assists and 2.3 steals per game. He was named to the All-Big East Second Team and the First Team All-Big 5. Kyle joined the 2006 NBA Draft and was selected by the Memphis Grizzlies and afterward, signed a two-year rookie contract with the team on July 9, 2006. He made his professional debut on the opening night of NBA’s Summer League in the game against the New York Knicks, scoring 6 points, 10 rebounds, 3 assists, 2 steals, and a block. Unfortunately, his rookie season came to an early end after 10 games as a result of a broken wrist which he sustained on 21, 2006 while playing against the Cleveland Cavaliers. He, however, had a successful surgery eight days later. Although the point guard was looking forward to having a long career with the Grizzlies, his expectations were shattered when the team picked another point guard over him in the 2007 NBA draft. During his time with the Memphis Grizzlies, Kyle played in 140 games, scoring a total average of 22.8 points, 8.4 rebounds, 10.4 assists and 3.5 steals per game. In 2009, Kyle Lowry was traded to the Houston Rockets in a three-team deal involving the Orlando Magic. He made the playoffs for the first time that season, averaging 5.3 points, 2.9 rebounds and 2.51 assists in 13 games. During the 2009-2010 season, he recorded an average of 9.1 points, 4.5 assists, and 3.6 rebounds a game. At the end of the season, he became a restricted free agent and signed a four-year contract with the Cleveland Cavaliers, worth $23 million. Unwilling to lose the strong player, the Rockets quickly matched the offer. He had successful seasons with the Rockets, scoring career high points which solidified his reputation with the team. In his third season (2010–11 season), Lowry started 71 games, scored 28 points and had a career-tying 12 assists, three rebounds and two steals in a win against the Memphis Grizzlies on December 3, 2010. As a result of his high performance between March 14 and March 20, 2011, he was, for the first time in his career, named Western Conference Player of the Week. In all his seasons with the Rockets, Lowry averaged a total of 44.5 points, 15 rebounds, 21.3 assists, and 4.7 steals. His success on the Rockets notwithstanding, Kyle had a fallout with Kevin McHale, the team’s head coach but apologized for his behavior during a 2014 interview with ESPN, as the team pursued him as a free agent. The 2011–12 season ended with Lowry missing time as a result of a bacterial infection. This gave room for his backup point guard, Goran Dragić, to play as a starter. Having played well, the team decided to trade Lowry in order to clear salary cap space and gain draft picks. During the 2012–13 season, Lowry was traded to the Toronto Raptors on July 11, 2012, and averaged more than 23 points and seven assists through the first three games of the season, but sustained an injury during the team’s fourth game. By the time he rejoined the team, he still regained the starting position. However, his presence in the team could not help the struggling Raptors return to relevance. The Raptors hired Masai Ujiri as its new general manager, on May 31, 2013. Ujiri, who saw Kyle’s hidden potential to be a star, challenged him to be a better player and leader in order not to end up becoming a $2-$3 million player. Accepting the challenge, Kyle Lowry entered training camp healthy for the first time in many seasons, ready to push himself beyond the limit. The following season, the young star played like never before and the Raptors became one of the best teams in the Eastern Conference, a feat many believed was achieved due to Kyle’s strong play and leadership. At the end of the season, the team had a franchise-best record of 48-34, third in the Eastern Conference and first in the Atlantic Division for the second time in franchise history. They also made the playoffs for the first time since 2008 but lost. At the end of the season, Kyle Lowry made an average career-best 17.9 points, 7.4 assists, and 4.7 rebounds. He entered the off-season as one of the most sought-after NBA free agents and subsequently re-signed a four-year contract with the Raptors, worth $48 million. Kyle Lowry and the Raptors continued playing tough in the 2014-2015 season and the team emerged again as one of the best in the Eastern Conference. In the game against the Washington Wizards on November 7, 2014, Kyle made his sixth career triple-double and his fourth as a Raptor, with 13-point, 10 assists, and 11 rebound, setting himself up as the team’s all-time leader in triple-doubles. On January 5, 2015, he became the second Raptor, after Chris Bosh, to be named as the Eastern Conference Player of the Month. He went on to win Player of the Week during the first week of 2015 having made an average of 22.3 points, 8.9 assists, and 4.2 rebounds during the month. Also in January, the basketballer was, for the first time, announced as an Eastern Conference starter in the 2015 NBA All-Star Game. This made him the third Raptors to be voted in as a starter, after Vince Carter and Bosh. At the close of the season, the firebrand player had participated in 70 games during the regular season, making an average of 17.8 points, 6.8 assists and 4.7 rebounds. He also made 12.3 points, as well as 4.8 assists and 5.5 rebounds, in the playoffs. He continued his strong play into 2015–16 season and was named as a starter to the Eastern Conference All-Star team for the 2016 NBA All-Star Game on January 21. Later, he became the third Raptor to participate in the Three-Point Contest. In the same season, he was selected alongside his teammate, DeMar DeRozan, as co-winners for Eastern Conference Player of the Month for January. For the first time, Kyle completed his second All-Star game on February 14, with 14 points, 10 assists, five rebounds, and two steals and also recorded his eighth career triple-double (sixth as a Raptor) with 22 points, 11 assists and 11 rebounds in a 122–95 on the 22nd of February. As a result of his outstanding performance from February 22–28 and March 14–20, he earned Eastern Conference Player of the Week twice in the season, becoming the first Raptors player to win the award more than once in the same season since 2009–10. With Kyle’s help, the Raptors reached 50 wins for the first time in franchise history and took the first spot the Atlantic Division for the third year in a row and second in the Eastern Conference. During the season’s playoffs, the Raptors made it to the Eastern Conference Finals for the first time in franchise history because of Kyle’s 35 points scored on 11-of-20 shooting, to go along with nine assists, seven rebounds, and four steals but the team was knocked out of the playoffs with a 4–2 defeat. The superstar player rounded of his strong season grabbing the All-NBA third team honors, becoming the third player, behind Vince Carter and Chris Bosh to receive this recognition in franchise history. Kyle was simply unstoppable throughout the following season. He set a franchise record by hitting all six of his three-pointers for a game-high 24 points and also set several season records, but eventually suffered a sprain on his left ankle and consequently, had to slow down. Following the expiration of his contract with the Toronto Raptors in 2017, the franchise signed him for another three years, on July 7, 2017, in a $100 million contract. He climbed up to the fourth position on Toronto’s all-time scoring list that year and also lead the team to several victories. He has played about 432 games (and counting) with the Raptors, recording an average of 107.1 points, 29.2 points, 40.9 assists, and 9.2 steals. 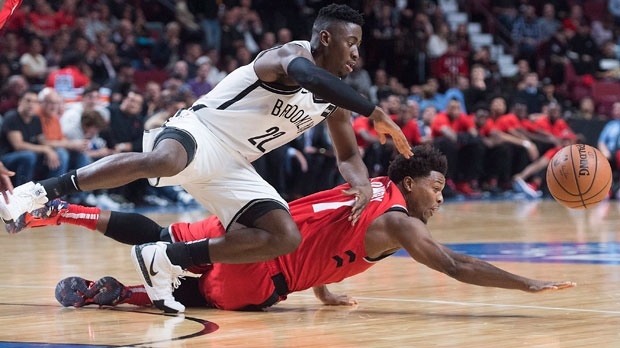 On March 23, 2018, Kyle recorded his 10th triple-double as a Raptor with 25 points, 12 assists and 10 rebounds in a 116–112 win over the Nets. Kyle Lowry has obviously carved a niche for himself in the basketball industry. He plays with so much passion and enthusiasm that people have often compared his playing style to a pit bull or bulldog. Over the years, he has developed himself to the point of becoming an example of what a player and a leader should be. No wonder he was described as the ‘unsung hero” and “the best team player out of everybody” during the 2016 Summer Olympics. According to the A-list player, he feels comfortable in Toronto Raptors and wants to finish his career there. Kyle Lowry is the son of Marie Holloway and Lonnie Lowry Sr. He has a brother named Lonnie Lowry. He is married to Ayahna Cornish-Lowry. The duo had known each other for when they were teenagers. They both did their high school at Cardinal Dougherty High School in Philadelphia, Pennsylvania, where Ayahna had a successful basketball career and also played well into college. The couple now has two sons, Karter and Kameron and in a bid to make a positive impact in the lives of the underprivileged in Philadelphia and Toronto, the long-time couple founded the Lowry Love Foundation in 2013. The basketballer has a strong physique with a towering height of 6 feet 1 inch (1.83 m) and a body weight of 93 kg (205 lb). Kyle also has black eyes and hair with a chest measurement of 45 inches. His biceps and waist measure 15.5″ and 35″ respectively. Entering the 2015–16 season, Lowry surprised his fans and colleagues with the unveiling of his new, slimmer body. He reportedly lost 15 pounds and dropped from 210 to 195, with only 4.3 percent body fat. His weight loss became a hot topic in the media after his colleagues, Kyle O’Quinn, posted a picture of the Raptors’ point guard on Instagram on August 5, 2015. Kyle Lowry explained that he did not just want to get ready for the season games but wanted to be a more effective player into his mid-to-late 30s. The effect of his new physique and body condition has been nothing but career-changing! Shelby Holliday – Bio, Is She Married, Who Is The Husband or Boyfriend?